If there is one thing that modelers really do need is a set of things like this. 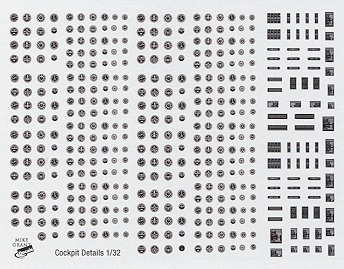 Mike Grant has produced two new sheets that are basically aircraft instruments and placards. These are incredibly useful when it comes to adding that extra detail to your next model. Mike has provided what are basically generic instruments for those aircraft that use round dials. Previously, all we had were Reheat's products and while those are fine, they were mostly for modern jet aircraft. These are obviously aimed at the older planes for there are no HSI's, no RHAWs indicators, no strip instruments, and so on. Just regular compasses, turn and bank indicators, voltage indicators, and the like. The placards are somewhat generic but great for use on gear legs and the inside of doors and the such. Mike has produced these in two scale; 1/32 and 1/48. Many of the 1/32 dials can be used on 1/48 models and you can probably use some of the smaller 1/48 dials on a 1/72 kit. I've shown the 1/32 sheet, but the 1/48 version is basically the same. A great idea and one that all aircraft modelers will find useful.